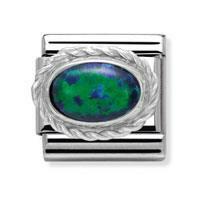 This new addition to the Winter Silvershine range features an iridescent Green Opal set with a twisted Silver surround. The Silvershine elements bring plenty of sparkle to your Nomination bracelet and are made with Sterling Silver on the classic Stainless Steel Nomination link. Engravable Rose Gold Double Link.